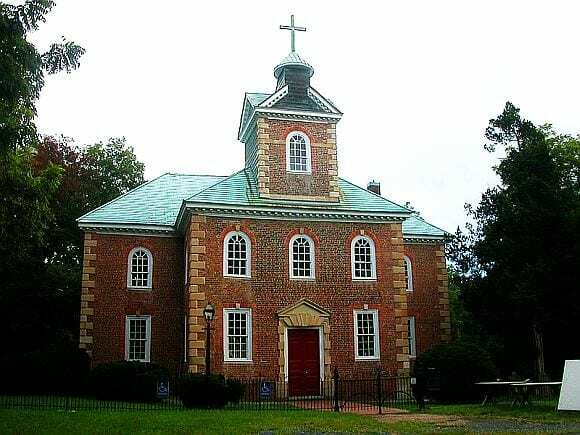 The Aquia Church in Stafford County, Virginia, is the first known house of worship of the ancestral family of Frank and Jesse James. Located in Stafford County, this old church was established by the Anglican Church of England, which constructed the church about 1667 upon the area’s first church of Overwharton Parish, which had burned. Its brick construction of Flemish bond masonry would become a hallmark of the mansion houses constructed later by John M. James, Jesse’s grandfather, in Kentucky. 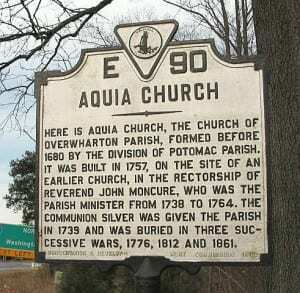 The Aquia Church is located on Jefferson Davis Highway (US Highway 1) the church is on a tree-ringed hilltop off I-95 (Exit #143A) just south of Marine Corps Base Quantico. The James family is first known to have arrived in the Virginia Colony sometime around 1620-1640. They arrived as Anglicans. The family became Episcopalians during the next fifty years. James family members appear in the Register of Overwharton Parish, 1723-1758. During the fiery and impassioned ministry of Rev. John Waugh, notoriously known to history as “Parson Waugh” of Parson Waugh’s Tumult that erupted in 1688, the James fell under Waugh’s anti-Catholic preaching. Like the James family, John Waugh (abt. 1640-abt. 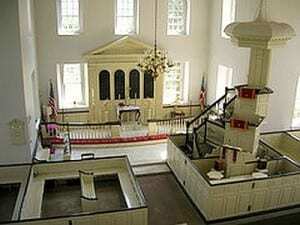 1706) had emigrated from England to the Virginia Colony. Among Waugh’s descendants would appear Gen. Alexander William Doniphan (1808-1887), Waugh’s second great grandson, best known to the Jesse James family as the leader of Jesse’s uncle Drury Woodson James in the Mexican War, and the General at Santa Fe when Frank James’ father-in-law Sam Ralston first explored his own settlement in the West before finally settling in Missouri. The Aquia Church was constructed with simplicity. No fancy wood carvings or distracting religious icons. Just solely an express and intent focus upon preaching the Word. Parson Waugh’s Tumult was an extension of the Glorious Revolt that led to the unseating of King James II, a Catholic. As King William assumed the throne to put an end to there ever being a Catholic king ruling over England again, the firebrand Waugh continued to preach to end royal rule over Virginia. Waugh urged his congregation to remain armed for their own defense. 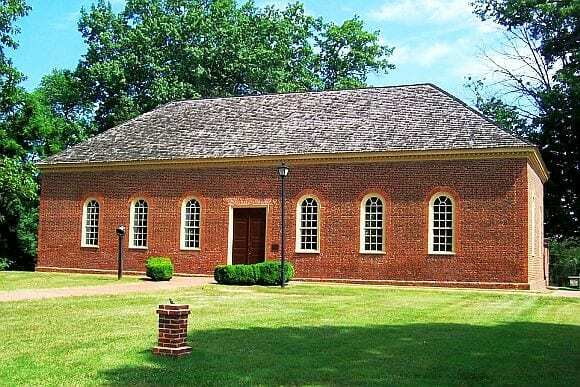 George Mason III (1690-1735), a third great grandfather of Thomas T. Crittenden Jr. the close friend and confidante of Jesse James’ son, lent his support and protection to Parson Waugh, to his congregation, and to the James. Ultimately, Parson Waugh was arrested, and George Mason was stripped of his command. 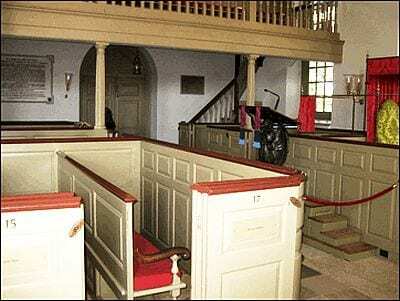 Construction of the Aquia Church, known today, was begun in 1751 and finished in 1757. Eighteen years later, the American Revolution began. hath been a very great delinquent from my business and lived a loose, rebelling life, which hath brought him to his untimely catastrophe.” King Carter was a third great grandfather of Maj. Hancock Lee who built the log cabin ordinary where Frank and Jesse’s mother was born. Carter also was a great-grandfather of General and President William Henry Harrison who led the James and the rebellious Baptist preachers of Kentucky into the War of 1812. Nathaniel’s eldest son, Peter Hedgeman (abt. 1700-1765), tendered his application for his father’s job, to which Carter replied, “As for entertaining his son, a wild young lad that hath no experience in the world, I can by no means think proper.” Despite Carter’s rebuff, young Peter Hedgeman rose to social and political in Overwharton Parish, serving in his lifetime as a justice, militia officer and presiding Burgess, representing Stafford County. Dissenters among the James and their in-law families associated with St. Mark’s Parish as the events of the American Revolution unfolded. At St. Mark’s, fourteen-year-old John M. James, destined to be the grandfather of Frank and Jesse James, first learned the power to disobey. The lesson came directly from his Uncle Henry, the son of Henry Field Sr. and Esther James. John’s Uncle Henry was one of the sixteen judges in Culpeper County who resigned their commissions, to boldly oppose King George’s Stamp Act. From Henry Field Jr., John learned that being disobedient in a civil manner could alter a person’s identity, and also change one’s course of destiny. These ancestral colonials and their associated families set the stage in their period for much of the dissention, conflict, and religious structures that attempt to influence political structures, not only in the time of Frank & Jesse James but also, in present day. Much more of this will be found in This Bloody Ground, the second volume of my Jesse James Soul Liberty quintet.